Cryptocurrencies have been in the news a lot recently and the market is as always wild with ups and downs in prices constantly. 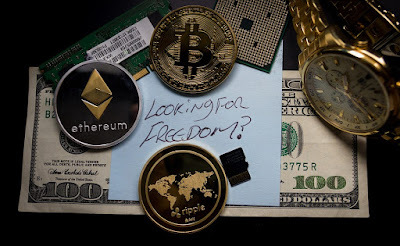 There are just so many cryptocurrencies out there that no one knows for sure which ones to choose. It must be noted that this list will include forks of Bitcoin. Some of these coins are Bitcoin Gold and Bitcoin Cash. These are also in no particular order as to which one is best, that's for you to decide, please invest responsibly. We're not responsible for any loses or any mistakes made by you, only invest what you're willing to lose. Bitcoin was created at the perfect time, that's probably why it became popular. The coin appeared in our world just around 2009 right after the financial crash of 2008. The creator is a mystery with only his name known to the world. Satoshi Nakamoto is someone or a group of people. Bitcoin is said to have been created by him. The coin was once mined using CPUs (processors of a computer) then miners moved onto GPU (graphics cards) and now ASICS (Application-specific integrated circuit.) It's one of the most well-known coins out there. Bitcoin Gold came about in October 2017. It's supposed to be trying to make Bitcoin decentralized again. The creators don't want the messy situation with ASICS to happen again. ASICS seem to have made mining harder for people who don't have a lot of money to spend on the machines. Bitcoin Gold fixes this by having an algorithm that can only be solved by using CPUs or GPUs. It uses Equihash and it's good to mine if you own a GPU and want to try mining for a little while. Bitcoin Cash like Bitcoin Gold is a fork of Bitcoin. It was created earlier than Bitcoin Gold and came in around August of 2017. It allows for the use of ASIC machines. The reason it was created is said to be because of the scalability debate of the original Bitcoin that had some issues involving high transaction fees due to a lot of people needing to transfer Bitcoin. Monero is popular among people who keep up with the crypto news of the world. It's been used to mine on websites and is easy to get into if you have a PC. Minergate allows for the mining and it was created in April of 2014. It also focuses on privacy which draws a lot of attention from people who just don't like other people having info on them and their finances. Dash is unique because it's also known under two different names such as Darkcoin and Xcoin. It even offers private transactions. It's said that Dash was released on January 18, 2014. As with most cryptocurrencies, it's decentralized and people like that. A fun fact is that it's said that within the first two days of it being launched, 1.9 million coins were mined. That's supposed to be around ten percent of the total amount that can even be mined. While Litecoin is a very well known coin it's not extremely expensive like Bitcoin. It's at the point where ASICs can mine it and there's even cloud mining option available for people to buy. It was released October 7, 2011. It's said to have been released on GitHub by Charlie Lee, who is a former Google employee. One of the reasons Litecoin is popular is because of its stability. Recently the price went up to around 200$ CAD but is currently around 140$ CAD. This coin is very unique. It's got the name of an internet meme in it and people actually care about the coin. It came out as a joke currency on December 6, 2013. It has since not been a very big joke. It's actually pretty popular but isn't worth too much. That can change at any moment with cryptocurrencies. It's said that it was created by Billy Markus who is a programmer. This cryptocurrency certainly has had one interesting ride and its ride isn't over just yet. This coin is fairly popular. This crypto was released on July 30, 2015. It's said that around 11.9 Million coins were mined during the presale, this is known as "premined." This is said to account for thirteen percent of the total supply of the coins. Confidence in this coin has been strong since it's seen support from several parts of the world, especially North America. The Ethereum coin was proposed in 2013 by Vitalik Buterin. Ripple is a coin that's been in the news a lot. It's been the coin that a lot of people seem to have hope for. Its initial release is said to be in 2012, however, the stable release happened in 2017. The original authors of the coin are Arthur Britto, David Schwartz, and Ryan Fugger. What's interesting about Ripple is that it's had a whack ton of support. In late January 2018, it had one of the largest market capitalizations. Zcash, it has the tech behind it to provide security for its users. It uses cryptography to provide this security. This coin has had an interesting history. It was once known as the Zerocash system, and before that, the Zerocoin protocol, it has since been developed into the Zcash coin that we hold so dear to our hearts. It was introduced on October 28, 2016. Roger Ver who was one of the investors into the coin and an individual from Johns Hopkins University, Matthew D. Green. These people were some of the founding team members. The founder and CEO of the company is Zooko Wilcox-O'Hearn. Overall cryptocurrencies are here to stay for at least as far as we can see. There's support for them, they have a history and could benefit the world in a good way by decentralizing our money. There are a lot of coins to choose from but you should always do your own research and make sure that only invest capital that you're willing to lose.